Parc Saint Paul has been through a rough patch in the two years since my last visit. Two serious accidents on park roller coasters (a derailment on Looping, followed in short order by a two car collision on Formule 1) might have brought down the shutters on many smaller parks, but for the moment at least Parc Saint Paul remains fully operational. We were unaware of the closure of Formule 1 prior to our visit, and while it was disappointing to miss out, safety must always come first. Hopefully the park and manufacturer will be able to resolve the issues with the ride and get it open to the public once again. 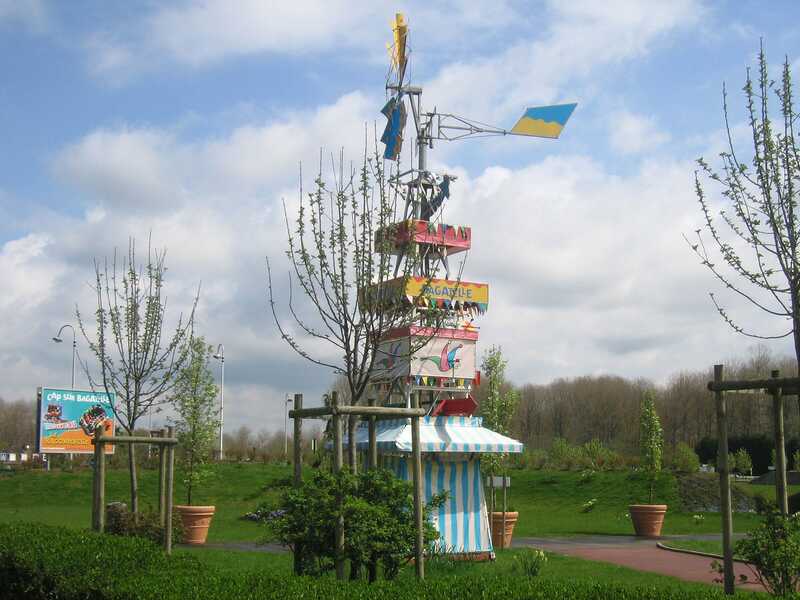 At the end of 2004, the park removed their Family Coaster and replaced it with a brand new ride with exactly the same layout. Only a coaster enthusiast would spot the differences in the mark two Family Coaster (#689), namely a chain lift in place of the old tyre drive and an upgraded lighting package. One Big Apple ride is the much the same as any other, though this one earned novelty points for being what I believe to be my first encounter with a DAL-built model. With that out of the way we took a quick lap on Wild Train, which remains as amazing as it was on our first visit. With plenty of time spare to explore the park, we had a look around the various other rides. Most were standard fare, though we did finally try out Telepherique, classed incorrectly by some enthusiasts as a coaster, albeit of the stand-up, suspended, and spinning variety. The ride features a track with poles hanging from it; passengers cling to these poles as they traverse the course. The amount of spinning is on the far side of insane; we found it very difficult to walk in a straight line after just one circuit. A certain Mancunian dentist, in his own words, nearly died on riding. George, always quick off the mark, immediately suggested that he should try again! The approach road to Bagatelle is littered with large billboards for Ragondingue (#690), a new coaster for this year. What isn't mentioned is the fact that the ride is second hand, having operated for six seasons at Pleasurewood Hills in the UK. The publicity similarly fails to mention that a nearly identical ride travels the fair circuit in France and has done for many years. Arguing over these minutiae is, however, churlish in the extreme, especially when one sees the sheer number of people waiting for their chance to experience the latest thrill. Much of the wait today was due to the lackadasical speed of operation, with no more than two of the nine cars on course at a time. Nonetheless, the riders faces indicate that the park does have a winner on their hands, even if it is a widely cloned one. I was far more excited personally by Bouzouk (#691), a Soquet built coaster somewhat reminiscent of the mine train at Parc du Bocasse. This model was installed above a lake, and its appearance was improved further by the strategic placement of a large fountain that the train gets extremely close to. The track then routes into a partially submerged trench, with water running down the walls on both sides. The setting turns an average ride into a superb one, and the experience is upgraded yet further by a superb restraint consisting of a single buzz bar allowing riders maximum air time. After several laps we moved across to the nearby Coleoz'Arbres (#692), a Schwarzkopf Jet Star operating with no restraints at all, resulting in an absolutely fantastic ride. After credit whoring Spirale des Dunes (#693) we went for a walk around the park with cameras at the ready. We found good angles from both the Ferris Wheel and Monorail, and indeed we managed pictures of everything worthwhile except the shiny new coaster, which was hidden carefully behind trees. We took comfort however from the fact that the average reader of this diary probably knows what a Spinning Mouse looks like; if anyone has been living under a rock for a few years then please follow the above link to see some examples. Trying to get from Bagatelle to Dennly's Parc without a navigation system would not have been fun at all. The route we adopted was almost certainly the fastest, taking less than an hour, but it routed us across quite a few roads with no sign posts. I recall reading an article about some villages complaining about the onset of satellite navigation, and from our drive today it was not hard to see why; roads only designed for local traffic are now in regular use from cross country travellers. Naturally, the destination was spot on other than one minor glitch, that being a request to make a U-turn after entering the official car park. I chose to ignore this advice. The park is home to a powered coaster called Tornado, a Zamperla ride installed by Top Fun according to the plaque mounted on the side of the station. The layout was very simple, consisting of an ascending helix followed by a descending helix. We were given four laps, presumably to make up for the short track length. The motor on the train seemed to be having a lot of difficulty, something slightly worrying given only two passengers, though perhaps the horrible straining sound was just for effect. 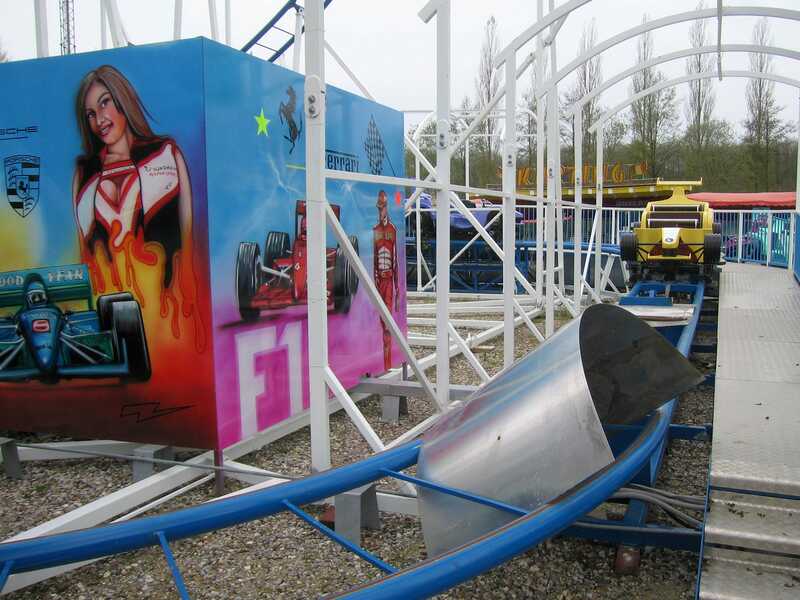 With the ride complete we moved to Furio (#694), a mid-sized Soquet family coaster that reminded us very much of Drakkar Express from Festyland. We have begun to realise that Soquet must have a few standard track designs that can be reused with minimal alterations; their rides certainly seem to have a lot more in common than would be typical for custom designs from other manufacturers. We also tried out a dark walkthrough called Chateau Hanté. I'd have enjoyed this a lot more were it not for a self-inflicted technical problem, namely my reactive glasses; the move from blazing sunshine into darkness renders me unable to see for at least five minutes before my lenses can adjust, and by that stage it is likely that I'll have collided head on with at least one unforgiving wall.